n0tice, the Guardian’s latest community project, has today opened to more users. The platform is an online version of a village noticeboard, allowing people to post and find community news and classified ads. It is location-based, enabling searches and delivering news related to any location worldwide. Guardian News & Media plans to make money out of the site, which was inspired by a hack day, by charging for featured ads and selling the white-labelled technology to companies wanting to use n0tice for commercial purposes. The platform has a read API, a self-serve white label version and feed importing meaning that it can be adapted for hyperlocals and “could potentially work just as well for hyperlocal community bloggers in northern England as it could for cricket fans in India or birdwatching groups in Oregon”, Sarah Hartley, community strategist at GMG and one of a team of three working on the project told Journalism.co.uk. The release today is a big one for us. We’ve added the ability to create your own n0ticeboard. If we can make citizen journalism possible in more contexts for more communities then I think we will have done a good thing. If we can also make citizen journalism a financially sustainable activity then we will have done a great thing. As we go along we are increasingly unsure of what happens next. Participants are starting to determine what we do more and more. So, if you want this platform to do something, please get in early and share your thoughts with us. The platform is in still private beta so invite-only, but Journalism.co.uk has 10 invites. 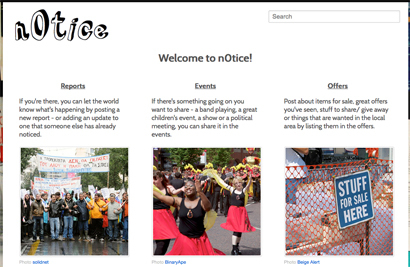 You can try to claim a n0tice invite by clicking here. This entry was posted in Citizen journalism, Hyperlocal and tagged citizen journalism site, Guardian News & Media, Hyperlocal, Matt McAlister, n0tice, The Guardian on October 26, 2011 by Sarah Marshall.